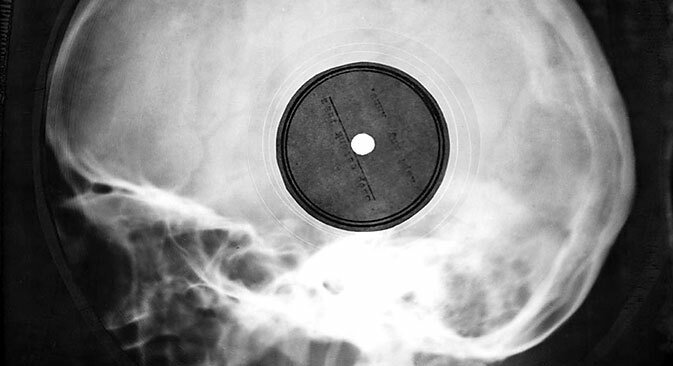 Two British musicians are recreating the underground Soviet practice of ‘pressing’ music onto x-rays, delving into its history while demonstrating the process in cities around the world. November will see the pair stage shows at two UK Rough Trade stores, as well as at Birmingham’s Vivid Arts media lab. British musician Stephen Coates, photographer Paul Heartfield and musician and vintage recording specialist Aleks Kolkowski have a passion for authentic Soviet sounds. While censored literature was easily reproduced by hand – ‘samizdat’ – music posed a greater challenge. The use of roughly cut x-rays – ‘roentgenizdat’ – peaked in the 1940s and '50s, before technological developments in the post-Stalinist period gave rise to new and better mediums. There was another reason too: by 1958, roentgenizdat had been made illegal in Russia, resulting in distribution networks being broken up and offenders imprisoned. The practice even inspired the producers of Russia's first post-Soviet musical film, Stilyagi - also known as Boogie Bones - directed by Valery Todorovsky in 2008. Set in the 1950s and known to English speaking audiences as Hipsters, the film focuses on the lives of a group of young music fans and the lengths they go to obtain jazz. It is thought that the roentgenizdat technique emerged in central Europe as early as the 1930s, accelerated by the wartime and post-war environment. Western icons such as Bill Haley, Ella Fitzgerald and Al Bowlly had their music pirated. However, local singer-songwriters also used the practice. The idea of working with x-rays gripped Kolkowski. He knew of several different recording materials, including, bizarrely, “lacquered cake boxes”. However, recreating the methods has not been an easy ride. New x-ray materials and techniques hindered the archaic process. “The problem lies with the stock of x-rays I can get hold of now - they’ve changed the composition,” said Kolkowski. “Back then it had a nitrate or acetate base with a coating on it – around 1960 they changed the base...they started using polyester and that’s much, much tougher ... I can’t actually get the same recording quality as I’m mainly using a newer stock of x-rays,” he said. The records were cut by hand – and not very neatly. Stories suggest that the holes in the middle were made with lit cigarette. “It’s a cool image isn’t it? Cut a record, have a cigarette, cause it’s a complicated process and than just 'tsss' seal it with a fag,” he said. Coates has spent the past eight years in and out of Russia, where he met a collector named Rudolf Fuchs, who spent time in prison in Soviet times for his role in the records’ creation and distribution. It was Fuchs who aided Russian popular singer Arkady Severny in the late 1960s, recording an album after the ban, which no doubt bolstered Severny’s carefully constructed ‘prison singer’ image. Myth and reality soon converged. “What I found moving is that Rudi went to prison...or Boris Taigin [one of the first samizdat poets] went to prison...and came out of prison and immediately started doing it again,” Coates said. “If I had spent two or three years in a prison camp near St. Petersburg - doubtlessly in freezing cold conditions - the last thing I’d do when I came out is immediately start doing what I went in for.” But Russian singers were doing that again and again. Neither technical troubles, nor Soviet bans could stop them. Today two British musicians pay homage to their strength and courage through this project.